As my payment for the goat, I agreed to do a guest blog, so here you have it; your first TC takeover. 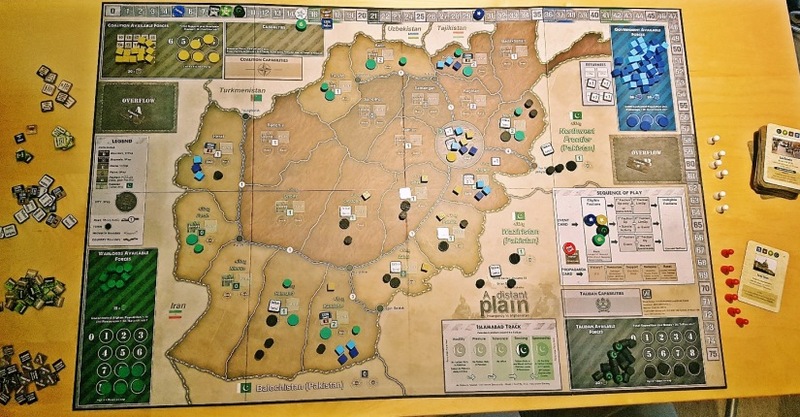 I’ll be reviewing A Distant Plain, one of the COIN series from GMT games, which I played recently. I’ve never been a big board-gamer – video games, yes, Megagames, obviously yes – but my boardgame experience has been limited to my Dad’s old games when I was a kid. Things like Escape from Colditz, Buccaneer, Risk, that one where you fly freight around SE Asia, but nothing from the last 30 years. We were recently invited down to Huddersfield to play a four-player game called Fire in the Lake with some friends, which is phenomenal but currently out of print. So, I went straight out and bought the previous game in the series: A Distant Plain, all about counter-insurgency in Afghanistan. Four factions are duelling for control of Afghanistan, but only one can win. Remember that point, because it’s important. The Warlords. You don’t like anybody – both the Taliban and the Government want to set up a restrictive government which will restrict your autonomy, and the Coalition objects to your drug trafficking. All you want is a nice quiet dysfunctional country where you can rule your personal fiefdoms and sell enormous quantities of opium – is that too much to ask for? You need to ensure that most of the country is Uncontrolled and to generate a large amount of Resources. You will need to leverage your very limited forces and status as the lesser evil to thwart everyone else’s ambitions. The game is card driven, with players able to see the active card and the next one to play. Two players act on each card, either taking the Event on the card, or something from a menu of Operations and Special Activities. Events are powerful, but prevent you from carrying out the actions which are the bread and butter of your activity. Most cards have two different versions of the same event on, representing two different possible effects of the occurrence. Every 13 cards or so, you’ll get a Propaganda card, which represents a lull in the fighting. Everyone redeploys and gets more resources – but most importantly, if you’re over your victory condition when the Propaganda card is played, you win immediately. For my first game, I was playing the Government. Jerry was my ally commanding the Coalition Forces; Judith led the Taliban; and Paul controlled the Warlords (ably replaced by Becky for the first two turns). It took about 20 mins or so for me to explain the rules, and we were off. The fact that you can only act on every other card – and that you have to choose between the event or an operation – means that you’re constantly balancing your priorities. Say the event for the turn is “Afghan Commandos” about the creation of a crack Government special forces unit. If I were to play the event, I’d get to move, Sweep, and Assault with a group of troops all in one. Normally that’d take at least two turns, and the card would probably let me surprise Judith’s Taliban and take one of her bases. However, playing the event will stop me from taking an Operation & Special Activity. Given that I want to clear Paul’s Warlord guerrillas off the main highways, I need a Patrol activity. If I don’t take the event, there’s a chance someone will take the other version of it (the shaded text) – and that would mean instead that the money and time which has gone into setting up these flashy forces reduces my resources and the aid coming in. This sort of dilemma happens on a turnly basis. In our game, it felt like the counter-insurgents (the Coalition and Government) were doing a great job of locking down territory and keeping the terrorists out. We’d seized the high population areas, and were concentrating on performing Civic Action (building schools, hospitals, wells) etc. to build Support among the populace. At least, that was Jerry’s focus. Remember, only one player wins. I was quite content with us seizing the high value areas – sounded like an excellent plan to me. And I was quite happy for Jerry to spend my resources on Civic Action and build up support. The problem was, what I’d really like to do after that is use my Govern special activity to, erm, redirect that aid. I can understand why Jerry thinks a new school is a good idea, really I can. But frankly, I think it’s clear that the long term security interests of the country would be better served by ensuring the loyalty of the local governor. For example, by building him a swimming pool. One of the uses of Govern is to convert Support into Patronage, which boosts my score but reduces Jerry’s. The problem was that Jerry had deployed bases into each of these high value areas, and the presence of a concentration of troops and international advisers makes redirecting the aid impossible. Thus, I found my goals forcibly subordinated to his. He did do some useful things, like winning a massive battle in Kandahar against Judith’s Taliban – I think Judith was shocked when she realised just how much damage massed coalition troops could do. But overall, my big strategic error was to fight the enemy too much. That sounds like a ridiculous statement in a game about a war. But remember my victory conditions: seize Control of as much population as possible, and get as much Patronage as possible. Nowhere in there does it say “kill the Taliban”. In fact, you’ll note that nobody has an objective requiring them to fight the enemy. Inevitably it happens – a lot – but it’s easy to get carried away with the total body count. Smash the Taliban or extort the Warlords? At one point, a couple of fortuitous events gave Judith quite a lot of opposition. From memory, the Pashtun population who make up most of the populace in southern Afghanistan were worried that my Government would erode their political dominance, and started backing the Taliban. Jerry’s pilots then helped matters by getting the grid co-ordinates the wrong way round and dropping an airstrike on a wedding. Suddenly, her Taliban were perilously close to victory. I’d assembled a decent task force of troops in Kabul, who I’d intended to use to sweep north into Balkh and take control of Paul’s opium fields there. The plan was to threaten him to pay me protection money not to burn them down until he refused; and then to use my Eradicate special activity to wipe them out and claim a whole load of additional Aid from Jerry’s international backers. Mwahaha. One brief negotiation (or if you prefer, bribe) later, my troops rolled south to threaten Judith’s bases. First problem; I settled for only 2 resources. Way too small a bribe. The Warlords might be lacking in forces, but after a few rounds of Trafficking, they have cash coming out of their ears. I should have held his feet to the fire much more. Second problem; my troops are, bluntly, useless without Coalition troops leading them. I split my troops to try and cover both bases, and wound up taking neither. I should have either barracked Jerry into committing some of his troops to lead the way, or just refused to deal with it and pursued my own objectives up north. Eventually, my over-enthusiastic support of Jerry paid off for him; he timed his Surge out to perfection, pulling all of his troops out of country immediately before a propaganda round. Mission accomplished, he gets to pose on an aircraft carrier flight deck with the banner, while I’m left holding the bag in an irritatingly democratic Afghanistan. Afterwards we all settled down to some authentically Afghan goat courtesy of Becky (which I gather she’s already blogged about). Overall, I’m absolutely hooked on A Distant Plain, and I’ll be buying Fire in the Lake (same company, but set in the Vietnam war) as soon as it comes back into print. The rules are quick to pick up but produce an impressive amount of strategic depth, and GMT games have done an excellent job of distilling what you need to know out of the rule-book. Each player gets an A4 sheet which lists all of their possible operations and special activities; and lots more of the rules regarding victory conditions, what happens in the Propaganda rounds, and the sequence of play are right there on the board for you to see. The event cards do an excellent job of making you feel like you’re fighting over Afghanistan rather than an abstract fictional country; and the interplay and constantly shifting alliances among the factions means you’re never quite sure who to trust. I’ll hopefully be running the game again in a month or so, and (buying and) running Fire in the Lake soon as well! Well done if you made it this far, and thanks for reading!